Alarming rumours were circulating in early 2001 of a spate of threatened closures in Bavaria, an area I had hardly touched. It turned out, as so often, to be political posturing by DB and the Bayern regional government - but the dedicated gricer dare not risk it! This particular weekend ADL were running an interesting looking freight lines tour in the Köln area, so that made a worthwhile peg on which to hang the whole thing. I had things to do in the east of the country as well, so ended up with a rather curious journey to Köln via Berlin! H delivered me to Telford Central for the 0841 to Lincoln which arrived more or less on time but with minimal heat, quite unusual [then] for a 158. On arrival at New Street chaos reigned. The 0915 Euston turned up late - for want of anything better to do I dived in, to find it full and standing. While it was still at the platform 0906 Brighton turned up (it was past 0930 by now) with plenty of seats, so I adjourned to that and was rewarded by it going first. Nothing to do at the airport but fester for a long time; at least BA/Maersk’s 737 to Berlin left more or less on time. It arrived slightly early (1415 vs 1420) at Tegel after a routine flight with horrible lunch, enlivened by throwing a G&T over myself! Luggage was reasonably prompt and I caught the 1442 X9 bus as planned (or rather, dreamed of). Unfortunately the main drag into Berlin was gridlocked so I took the opportunity to dive out at the Jakob-Kaiser-Platz U-Bahn stop. This proved a good bet and a very quick trip on U7 and U2 (changing at Bismarckstrasse) got me to Zoo by 1500 in plenty of time for the 1521. Back on U7 from Wilmersdorfer Strasse on Sunday might be good. An impeccable ride, punctual at all stops (and enhanced by a Schültheiss pilsener and a Paulaner weissbier) on ICE 846 to Köln Hbf (it has a Düsseldorf portion which splits at Hamm) via Hannover, Bielefeld, Hagen and Wuppertal. Hotel Alemania is right by the station and seems perfectly adequate. Successful rendezvous with IM after a wash and brush up; we repaired to P.J. Früh’s for ‘home brewed’ Kölsch and a schnitzel. Upon return at 2230 I checked the tram time for tomorrow. Or so I thought. 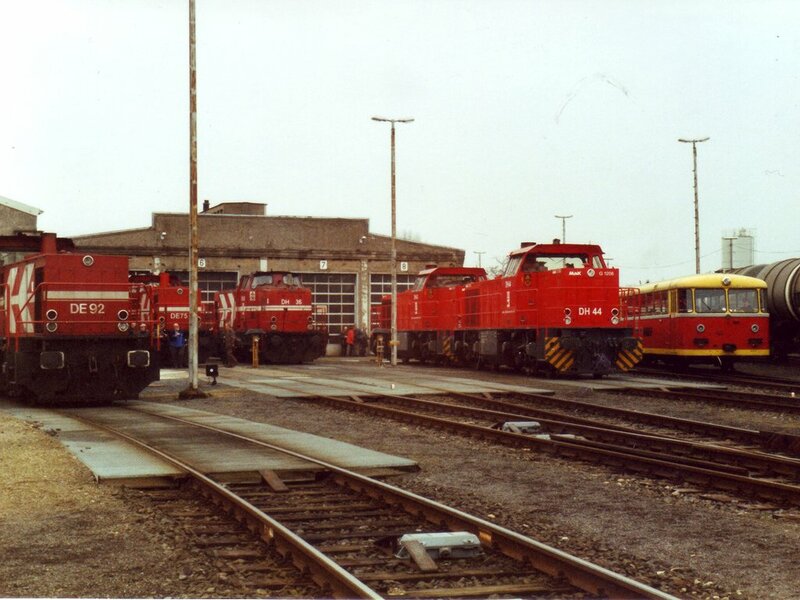 The tour train with an impressive array of HGK motive power at their depot at Brühl-Vochem on 3.3.01. Just made it to Breslauerplatz U-Bahn for the 0803 tram; when it appeared it had Sürth on the front. A mistake I’ve made before… On the whole I try to learn from my mistakes so this time I waited for 0818 which was joined by a large number of ADL patrons at Dom/Hbf. At Wesseling the tour train departed ½ hour early and went down a short branch to the depot where the Köln-Bonn railway society has an excellent small museum. On return to Wesseling we ran through non-stop leaving a certain British individual standing on the platform to the great amusement of all who saw it. Bonn Buchsdorf proved a worthwhile branch, the train stopping two wagon lengths from the factory gate which seems to be the end of the branch now. Back to Wesseling via a short loop round Wesseling Süd station (we did this southbound as well) then on to Rheinhafen where a double reverse was required to gain access to the short branch between dock and river. 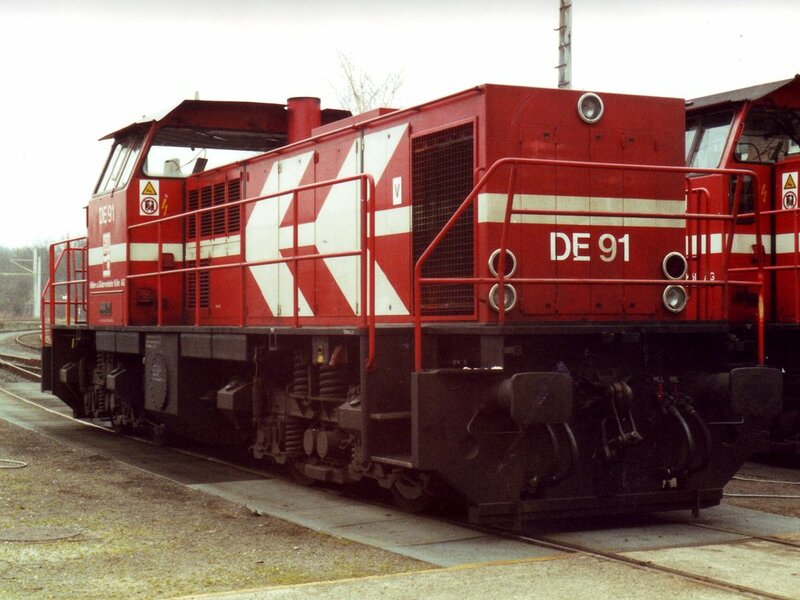 HGK's Bo-Bo diesel electric DE91 at Brühl-Vochem. Returning from there we went straight across without any reversal and round the north curve on to the ‘Querhahn’ line across to Brühl-Vochem where two more reversals were needed to get into the depot. 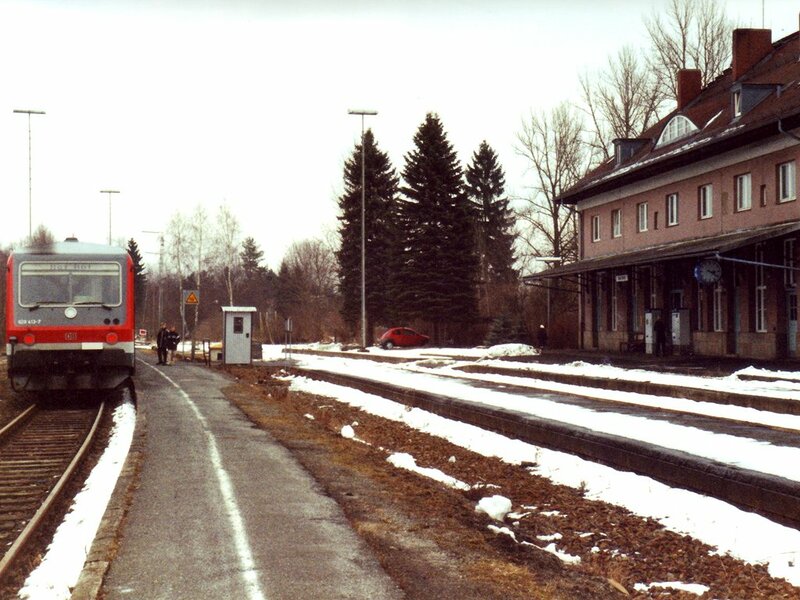 The depot lies between the HGK line and the DB connection to Brühl Gbf on the main line. 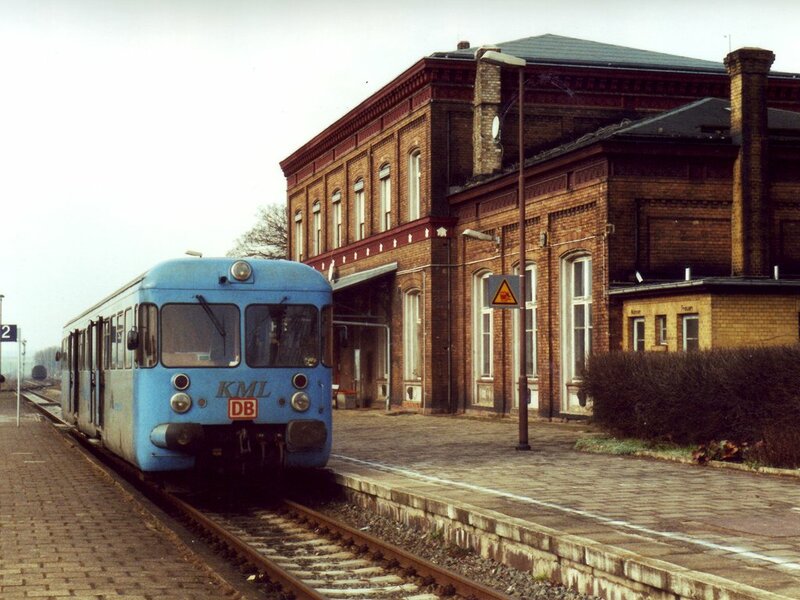 After a shed visit the train ran out on the goods line to the north of Brühl-Vochem, reversed and returned to the museum on the north side of the DB connection. From there up to Kendenich where we left the tram route to join Rheinbraun lines to Wachtberg then east on to tram route through Frechen, diverging north to do a freight only line round the north of Köln via Köln-Bickendorf and Kö-Niehl to Köln-Niehlhafen. Several freight lines on to docks here, plus one (which we did) round the end of the K-D Line ‘depot’ and back. On the return the train went down one of the various dock lines before heading back. Just south of Köln-Bickendorf a short depot branch was done, situated between the HGK ‘main line’ and the curve connecting it to the DB Köln-Aachen line. Once back on the Rheinbraun lines we ran round the loop at Berrenrath then headed north to Auenheim and then southwest to Hambach where an awesome hole in the ground is visible from the bridge carrying the loop over the conveyors. Back at Auenheim we took the west to north curve on to the Nord-Süd line and continued to the northernmost loading point at Garzweiler (a couple of hundred metres short of end of line). There was an unexpected trip round the other two sides of the triangle at Frimmersdorf which connects the RB system to DB at Güstorf. By now 45+ minutes late, we ran straight back to Brühl and Wesseling (goods line again at Brühl-Vochem) arriving just after the 1909 tram. Kürfürsten Kölsch was taken in the station Gaststätte. IM, PM, AW, DM and I retired then to the Küppers brewery tap for roast pork and variously Kölsch and Weissbier. Then on to the Sion brewery tap and Sünner im Walfisch for further Kölsch sampling. From all this we came away with a much better overall impression of Kölsch than you’d get from a quick test of Dom Kölsch! IC119 to Ulm, Garmisch, Berchtesgaden, Seefeld am Tirol sometimes, and who knows where else, arrived on time with 120121. I eventually found my seat after the locals had sorted themselves out, this being as ever a very long process. You might just as well wait for them! Slow running and a missing fast line at Andernach had us 15 late at Koblenz. This was back to 11 at Mainz Hbf which was approached on the centre tracks (the southernmost, KBS661, seems to be a bi-di single line.). We were on the southern pair at Mainz Süd, where the new tunnel looks ready to receive track. Thence via KBS660 and Bodenheim, Oppenheim, Worms, Ludwigshafen Hbf to Mannheim (P14, towards north side). Exit from Mannheim was under flyover then north side of the yard between Mannheim Rangierbf and Seckenheim. At Heidelberg the deficit was 8 minutes. Heading on KBS701 towards Karlsruhe I was surprised to find the train on a curve on to the Mannheim-Stuttgart high speed line. 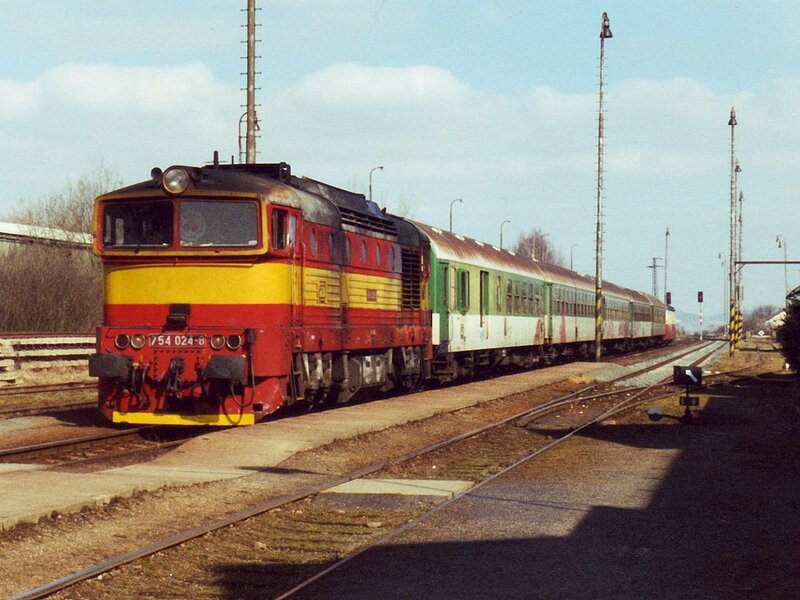 No sign of this (or the corresponding SW-SE one on which another IC was waiting) in Schweers & Wall. Further enquiries required [one of their rare errors, it would seem]. Layouts at Bauerbach and Vaihingen were as shown. We joined the line from Ludwigsburg/Heilbronn and went into Stuttgart Hbf on the east side, via Zuffenhausen. Arrival at S-Hbf (P15 according to the sheet) was 7 late. Loco changed, we left 5 late. The ‘IC’ seen at (presumably) Ubstadt turned out to be IR2669 with an IC DVT leading, and arrived just after us. 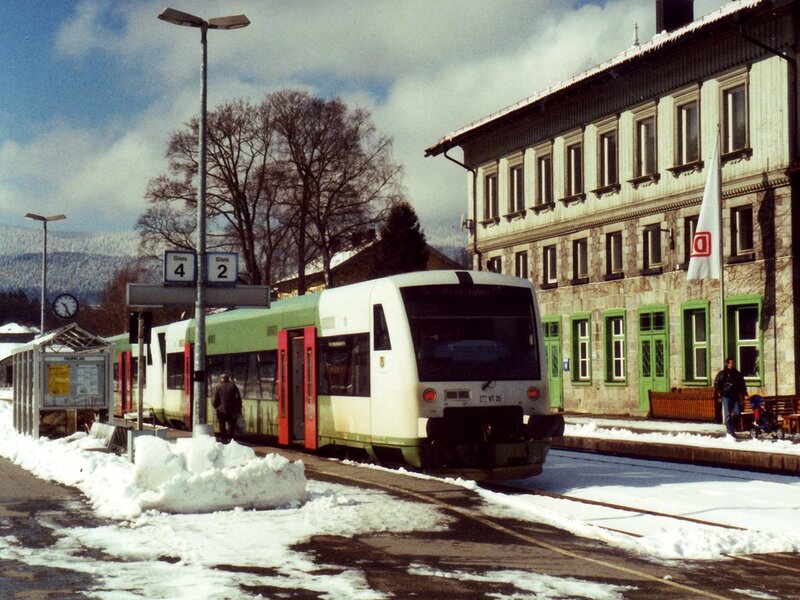 The 1339 to Krumbach was a 2 car DMU of unknown vintage which set out from one of the main line platforms and not P1A (a bay) as advertised. [Probably a Good Thing, ensuring the physical connection.] Track seems OK on the Krumbach line, with evidence of new platforms and reballasting at Ichenhausen. On arrival at Krumbach a timetable check revealed that I was indeed stuck until 1600. To my great relief Krumbach is a town of at least Bridgnorth size, and 10 minutes walk to the Markt was rewarded with a very pleasant and very open pub purveying Aktien Hellesbier, from Kaufbeuren. An advertisement for Bradbury & Co Ltd., sewing machine, bassinette and cycle manufacturers of Oldham was on the wall. After two glasses of Aktien I left tired, if not emotional! 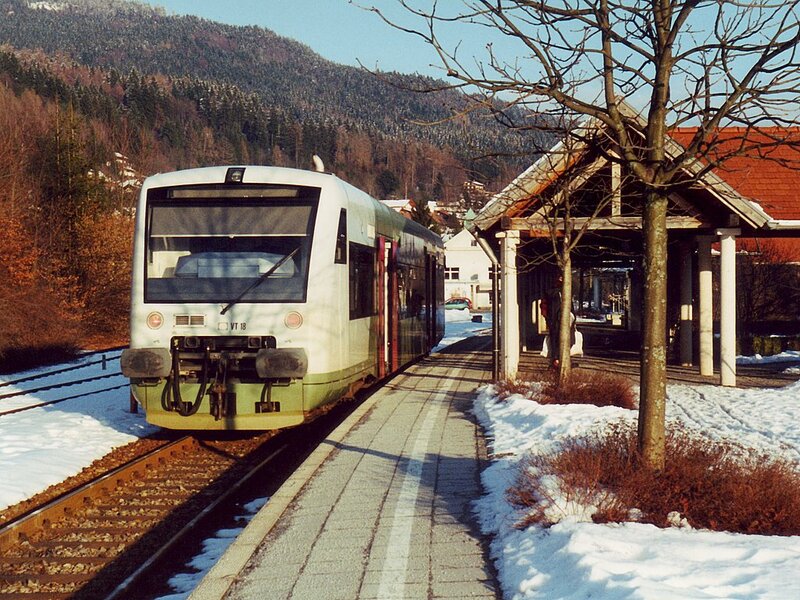 The arrangements for terminating trains at Krumbach are equally satisfactory – it is operated as though for strict right hand running. The Günzburg train had arrived at P2 (west) then reversed north and returned to P1 (east) from which it departed. The Mindelheim train arrived in P1 (east), retired north and returned to P2 (west), the net result being a highly satisfactory overlap. All in all, a line which looked like a potential nightmare turned out well. Further result with a successful 1640-1644 connection at Mindelheim. The line south of Krumbach seemed also to be in reasonable shape though it has large numbers of ungated crossings requiring slow approach. The RE to Buchloe gave me time to reappraise the timetable and spot 1706 Buchloe - München, EC95. This appeared on time and very briskly, being 7 coaches of Swiss stock behind Rabbits 313 and 317. A last minute signal check outside München caused me to miss the 1748 to Nürnberg by about 2/3 of a platform. Sadly the only alternative was to repair to the Augustiner Bierhalle (where there was dreadful ‘local’ entertainment of singer plus ‘accordion and bass’ machine) for a superb weissbier before joining IR2306, 1849 to Regensburg. Which was busy but close to right time. The Ibis next to Regensburg station seems better than average at first glance. [Probably why it’s no longer an Ibis]. As does Regensburg. Bräuhaus Joh. Albrecht in Black Bear Street provides excellent Messing (that’s the beer) but very unexceptional food. [Strange – several years later I had the same experience with another Albrecht pub. Maybe it’s chain policy!] The general atmosphere is a bit like a ‘Firkin’ though with assorted ancient music - Lovin’ Spoonful, Sailor, Simon & Garfunkel etc. Bischofshof (north side of the cathedral) is a swish hotel with no bar ‘as such’. Beer was pilsener-ish, very unexceptional, served in a dining room complete with scowling bishop (and delightful waitress). Rain continued unabated until 2250 when I returned to the Ibis, and so to bed. Standard Ibis breakfast was quite sufficient after 3 days ‘pigging out’! Off to Regensburg Hbf (noting 105 DM is standard rate for that Ibis) for 0831 IR to Praha. Incoming electric was relieved by an unidentified 232/4. A fairly dull ride on a fairly dull morning to Schwandorf where the front portion was left behind and the rear one acquired a Rabbit. I was somewhat surprised to be gripped by the Grenzpolizei just after Schwandorf; the GP man was equally surprised that anyone would want to go to Cham! He must know about the mozzies. We passed 232653 on a freight at Neubäu. Several people decamped at Cham where a Regentalbahn single unit was waiting in the north-east bay. The driver seemed content with my EuroDomino. Schweers & Wall have it slightly wrong in that there is no separate line between Cham and the junction which is at Km 50.7. It’s a long and winding road up to Kötzting where, unfortunately, the Regentalbahn and Oberpfalzbahn use opposite sides of the island platform. Shrug. The driver of the very posh Oberpfalzbahn railcar was also happy with the Domino, which saved me a few marks. As far as I know, no more private lines until Saturday now. At Lam the possibility of a bus to Bodenmais or Bayerisch Eisenstein was in mind; there was one to B.E but only at 0840 and 14-something (it was about 1115) so nothing to be gained. 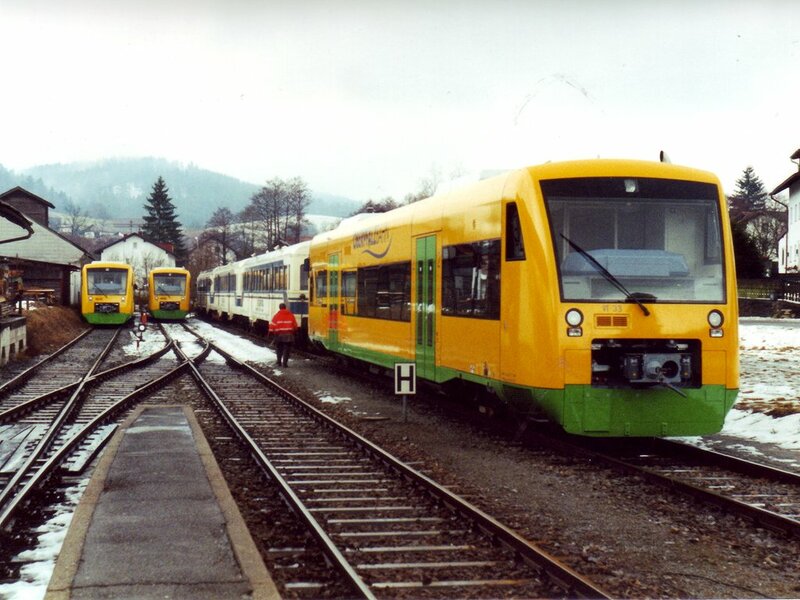 Quite a number of units at Lam - 4 each of O/pfzbahn and R/talbahn. It seems a serious operation - perhaps to extend? A bit disappointing to get a kart on the 1223 Cham - Schwandorf rather than a Rabbit. At least it’s on time, there being a 3 minute connection at Schwandorf for Nürnberg. Which I made (I guess it would have been held for a train from Czech anyway). The tables turned as this was a 218 instead of the expected kart. Another S&W inconsistency is that the connection on to the Nürnberg line at Irrenlohe is north of the station, not south as shown. We crossed the Pegnitz after Pommelsbrunn to run via Hersbruck rechts Pegnitz on the north side of the river. The physical connection is well east of Hersbruck but there is a third track as far as Hersbruck so S&W is right-ish. Into Nürnberg Hbf via the lower level lines ending up on the south side. 13 minutes allowed just time to collect a sandwich and a beer before EC29 ‘Josef Haydn’ at 1430 from P9 to Regensburg. This took the southernmost line all the way out of Nürnberg, as suggested by S&W. A very long TSR before Deining put paid to the timekeeping, but the connection at Regensburg is booked. And was held. 101125 departed first pushing EC29 and the IR departed 4½ late at 15:39:30. Arrival at Landshut was fine but things went awry thereat, with the 1635 Nürnberg being advised 10, then 15 late. The 11 minute connection at Neufahrn was held though and duly got away 5 late. The platform used at Neufahrn is a through one accessible from the main line. The Straubing and Regensburg lines run parallel for some 2 km out of Neufahrn but the connection is just outside the station. Purposeful operation got the kart to Straubing on time - it waits there for 10 minutes 1643-53 which was a pity with the light going. Made it to Bogen in sufficient daylight at least to attempt a photo. The branch seems to be in good shape possibly excepting the Danube bridge which was taken at a fairly modest pace. There’s another bridge over a smaller channel which makes the whole thing a very big structure. Daylight finally expired on the way back at Straubing while awaiting the RB to Plattling so despite the odd timekeeping concern it all panned out very well. The RB and the subsequent RE to Passau were 111 powered, dull but worthy (and punctual). Holiday Inn turned out to be across the road from the station, and so expensive I asked the receptionist to confirm my rate (yes, it was 110, well under half the rack rate. Well done HRS). Passau is definitely a town not stuck for the odd 30 billion. All in immaculate repair, very smart shops and beautifully restored old buildings. Etc., etc. Certainly well worth a tourist visit, though no doubt the rack rate is applied in summer. [It must be said it’s had some horrendous flooding since my first visit there. Last time I was only there a few minutes and didn’t have time to go and have a look]. Beer & schnitzel at Der Goldener Schiffe which is in the GBG, wholly admirable and advertises double rooms for DM80. Winter rate, I guess. Peschl Helles if a tad undistinguished. Peschl weissbier on the other hand is full of flavour and very enjoyable. Highly recommended. The schnitzel turned out to be two schnitzels. No supper tomorrow. Definitely. ‘No food’ policy took a bashing from the Holiday Inn’s breakfast. Full English was taken for the first time in Germany. Best left, I think. Back to German tomorrow. 0824 proves surprisingly to be the only departure 0800-0859. The run up to Plattling was track, technically, as it was dark last night when I left Straubing. Valleyish for a short while beside the Danube, then flood plainish for the rest, and rather dull. 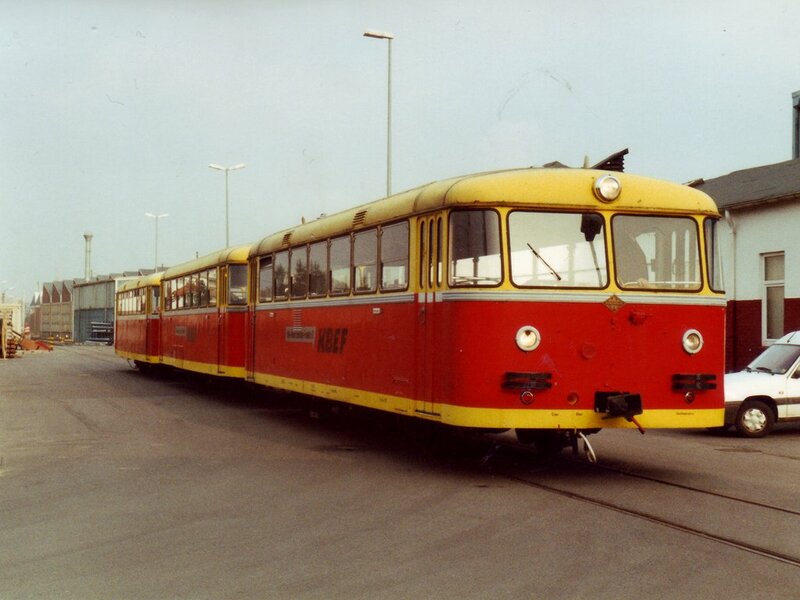 The Waldbahn unit was waiting at Plattling - two single car karts of the same trapezoid window Adtranz variety as the Oberpfalzbahn yesterday. A very enjoyable ride up to Bayerisch Eisenstein on a cloudless morning. The units cope very easily with what must be a fair climb with BE being 2300 ft or so (and still quite snowy though thawing well). BE has the border half way down the platforms - trains could cross but unfortunately don’t with the possible exception of one Sunday one. I think opposite ends of the same island platform should count! No mobile phone signal to advise H of temporary departure from EU. It was quite difficult to persuade DE and CZ border police to take much interest, either. The Czech train arrived on time with 750078 on four coaches. Excellent if very slow ride to Janovice nad Uhlavou in very hilly country (4000’ +, they’d be mountains at home). Absolutely nothing when I got there - no pub, no shop, no phone box. At least the mobile worked. Only 20 minutes to wait before 754024 turned up with another 4 dirty ‘Mk Is’. Better than a string of railcar trailers I suppose; a beer would have been welcome though, to mark the last cross border line for some time (the next one round is from Passau towards Linz). Physical connection at Janovice is west of the station so no problem there. Fare was CZK60 each way, about £2.50 the round trip. A decidedly less immaculate 'Goggle', 754 024, arrives at Janovice with my return working. There appears to be a bogie railcar, possibly an 830, attached at the rear. Back at BE the various border police were even less interested. The Czech train was on time so I had the full 5 minutes for the connection to the Waldbahn karts – the same two as before having presumably been to Plattling and back while I went to Janovice. Qualified success in my 55 minute stop at Zwiesel. Couldn’t find either GBG entry, but located an establishment selling Wolfgang Pfeffer’s Zwiesel Dampfbier. [A genuine sounding brew, if ever I heard one - but actually it is, the brewery being owned by Dr Pfeffer!] This was a pleasant enough beer, in an elegantly labelled 50cl swing top bottle at DM 4.50. Back at the station a toiletless Regentalbahn kart made me grateful for the facilities at the pub! The ride to Grafenau (from P1, but connection is west thereof) is superb and must have been very hard work in steam days. The handwritten ‘Rettet die Waldbahn’ sign at Grafenau presumably means that there is some substance in the closure rumours. Traffic levels are certainly not high, with only half a dozen or so passengers and no apparent freight. Sunny weather continued back to Zwiesel where another ‘Waldbahn’ Adtranz kart was waiting to go to Bodenmais. This was in P3 which was a bay platform. There is access from the ‘main’ line without reversal; B/Eisenstein trains use P4 anyway, so connection is done! A much shorter and less dramatic run up to Bodenmais, but still scenic. 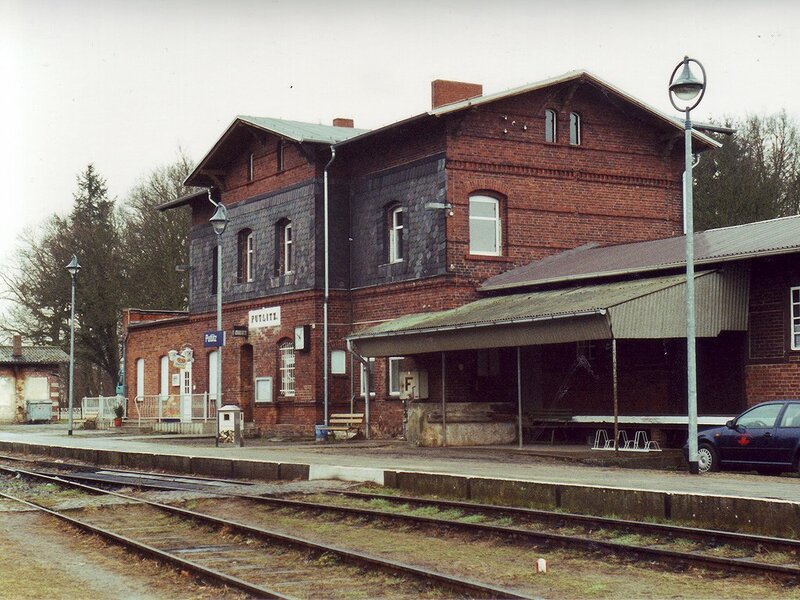 Bodenmais station (which has DB ticket machines, like the B/E to Plattling line) has a modern shelter in the traditional pitched roof on two rows of pillars style, with concrete pillars and tiled wooden roof. All rather opulent and seemingly related to the adjacent building which I couldn’t identify. While writing this note, the driver came to inspect my EuroDomino and went away content. A class 628 unit waits at Helmbrechts, terminus of a branch from Münchberg on the Lichtenfels - Hof line. The line used to continue north, beneath the bridge whe're I'm standing, to Selbitz on the Hof-Saalfeld line. Back to Plattling with the last of the light, it being dark when we got there at 1847. 1901 Passau was 7 late. In the interests of research, off to the Stadtschreiber which is definitely a proper pub. The only draught was Warsteiner (mistake) but there was an excellent bottled weissbier from Andorfer (local brewer). Food a minor prioirity, if at all. Attempts to visit the Löwen brewery tap were frustrated by it being closed (2145 on Tuesday?) but the Innstadt pub in Kleiner-Exerzierplatz provided an excellent weissbier and looked a good prospect for food. Relatively convenient for station also. It’s called Wirtshaus Bayerische Löwe. The Löwen brewery tap looked pretty dreary, to be fair. Up early by recent standards, for 0756 to Mühldorf by the scenic route (I hope). The HRS rate of DM110 contrasted very favourably with the Holiday Inn’s joke rack rate of DM314. The line to Mühldorf was a very pleasant rural ramble for about 10 km but unfortunately it’s very boring for the last 80! Despite being nominally a valley line (of the Rott) it’s flat and featureless. And my phone is malfunctioning, refusing to talk to D1-Telekom despite the presence of one of their masts (I assume, it being on one of their buildings) 200m from the platform end at Mühldorf. I had to contact H by landline for mutual assurance of well-being. A short (and slightly late) trundle out to Garching didn’t seem to carry any risk of a missed connection - and didn’t. The third kart of the day was sitting waiting in P1 which is a loop so will be counted as ‘connection done’. The line starts with a bit of variety and has a handily placed brewery (and brewery tap) next to Wiesmühl (Alz) station. Two factories at Schalchen both had wagons in their sidings – one wagon loaded with stainless steel tubes in one and several hopper wagons, contents unknown, at the other. A yard at Trostberg contained a 212, a number of tank wagons and three hoppers, much whitened on the side so perhaps china clay. The Alzmetall factory at Altenmarkt has a rail connection, apparently unused. Stein (Traun), not to be confused with Traunstein, has a brewery (Steiner) as well it might with a name like Stein. The Traunrauf branch at Hörpolding showed signs of recent, though not heavy, use with nine covered wagons in the sidings at Hörpolding station. Reasonably serious Alps in the distance, which looks odd with no foothills to speak of. They’re over 2000 metres nonetheless. There was one more freight connection - looked to be possibly a BinLiner type of operation - before the outskirts of Traunstein. The line winds in through suburban back gardens for the last couple of km. Final stopping point was a bay between two through platforms. 1201 to Roseneheim was a pushed RE to München, an odd ride geographically, with mountains one side and serious flatness the other. Pushage was provided by 111216. The kart for Mühldorf was waiting in the adjacent platform at Rosenheim. Uneventful amble to Mühldorf via Wasserburg, noting a pub fairly near the station at Wasserburg for when I get stranded later (though may try the bus into town). Mühldorf, bless it, has a station buff where a Spater Helles was very welcome, it being nearly 1400. Same kart back to Wasserburg at 1409 for a 90 minute wait, having found no more rational or time-efficient way of doing the Rosenheim - Wasserburg - Mühldorf - Wasserburg - Grafing ‘Y’. I decided to get the bus down to Wasserburg in case the aforementioned pub was shut (it wasn’t, but no doubt would have been had I decided to go there instead!). This involved DM1.50 and about 5 minutes wait. Wasserburg turned out to be an old market town in a loop of the river Inn, a little bit run down by Bavarian standards but possessed of an establishment called ‘Bierhaus’ which seemed about right. Franziskaner was very acceptable, and the amiable landlady gave me vague but sufficient directions to the bus stop (I’d alighted one stop too late). Returning on th 1600 bus, timed to connect with Rosenheim, Mühldorf and Grafing trains (Prescott, please take some notice) I found that the small new platform on the east side just south of the station was the Grafing one – fine as it involves crossing the layout to diverge south west on to the Grafing line. The Grafing line is quite a pleasant rural trundle until (and even when) it meets the end pf the S-Bahn at Ebersberg. A slightly late incoming S-Bahn delayed us (it’s single line still) and we left Ebersberg 3½ minutes late for a 4 minute connection. Arriving into Grafing Bf the RE was tearing up the bank, shot past us but stopped simultaneously. Connection made, the RE reached München Hbf P9 or thereabouts (last of the suburban platforms on the south side) as suggested by S&W. Memo for later: the warning in the K-Buch about taking 10 minutes from P1-9 to the main platforms and 15 to the S-Bahn should be taken seriously. ICE 782 was a new generation one bound for Hamburg. The wisdom of reserving a seat on a rush hour München - Hamburg ICE was very apparent! Dark well before Nürnberg which was reached on time after being 1 down at Augsburg and 2 at Donauwörth. The connection on to 1944 RE to Bayreuth was no problem therefore. This appeared from the noise to be a 218 and arrived in a wet Bayreuth close to time. Multimap’s street map was totally misleading and caused me a long walk to a hotel which is actually very near the station - and very overpriced, seemingly just because it’s Bayreuth. HRS saved DM10 but it’s still far too pricey. Intending an early night, thirst got the better of me and I headed to Bierbräuereischänke am Markt for an excellent unfiltered, darkish, sweetish Bayreuth(er) beer. The Markt is very handsome, and spoilt by having the bus station in the middle. Absolutely astounding for such a place - what were they thinking of? Maximilianstrasse is a very fine street though. Round the corner (ish) to the Braunbierhaus where Schinner’s ‘brown beer’ was on offer in a smart but unwelcoming establishment. Not bad ale in a sweetish sort of way. Brown ale, I suppose. I called it a night at this point in the interests of getting some proper sleep. 0525. Not A Good Thing. Still dark of course, but not raining for the short potter to the station. The hotel cleaner eyed me with great suspicion as I left, not knowing that I was returning for breakfast I suppose. 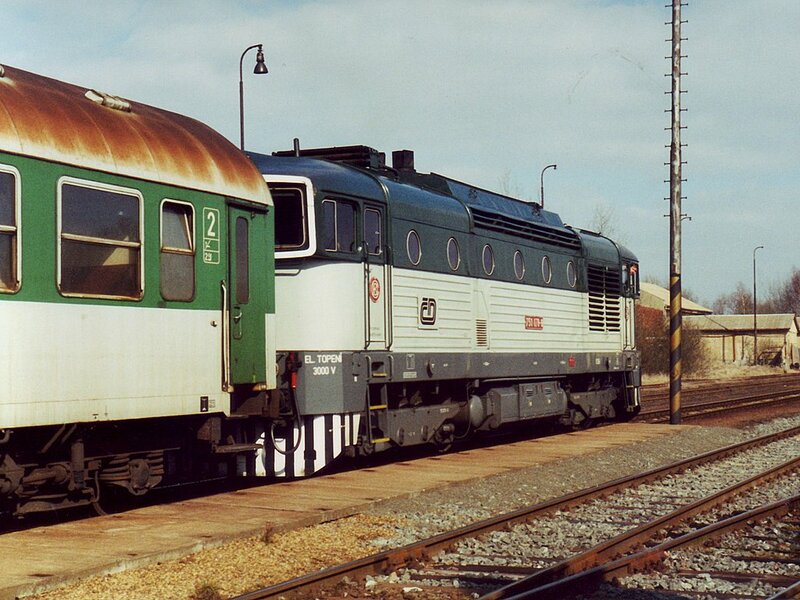 0550 for Weidenberg had just had 218187 attached to its two coaches - shouldn’t lack power. It didn’t need it either, for a slow trundle up to Weidenberg which is a small town high enough to have a few remnants of snow. The 0550 and 0647 return are the only 2nd class only services in the timetable - presumably therefore, the only loco hauled ones so the Rabbit was an unexpected bonus. A short wait at Münchberg, noting another Rabbit on a Hof-Bamberg train. The Helmbrechts branch joins by the motorway but runs separately beside the main line to Münchberg, the physical junction being half way between the geographical junction and Münchberg. The rest of the line into Münchberg is a long siding terminating in P1. It appears that Münchberg-Helmbrechts workings (Sat & Sun plus at least two on weekdays) use P1. The remainder (though to and from Hof) have to use PP2/3. 45 minutes at Helmbrechts is easily 40 too long. The Gaststätte is closed and there is only a post office nearby. Quite a good phot from the bridge though. Very scant patronage on the branch – 2 from Helmbrechts - Münchberg and one thereafter. At Hof a half hour break allowed a bespoke mayo-free baguette and a Scherdel Pils (former excellent, latter pils) in an awesome former station restaurant. Red marble pillars, gilded decoration at the tops, moulded ceiling, etc., etc. 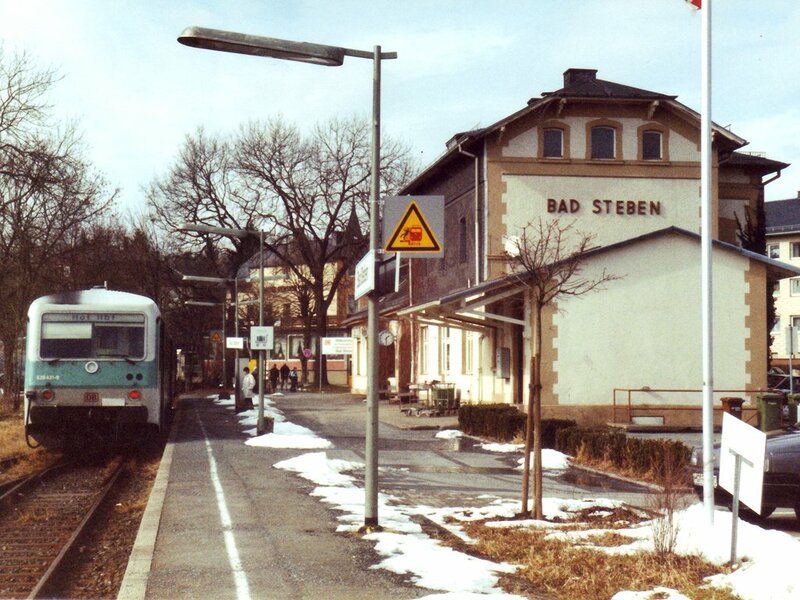 The 1237 to Bad Steben is a convenient addition to the normal 2 hourly service. It waits for 10 minutes or so for schoolchildren at Naila so has only a 6 minute turnround. Bad Steben looked a pleasant enough small town with a pension and a bar or two close to the station. It’s on a hillside fairly high up and could be bleak on a cold windy day. It’s a very nice run up from Hof through vaguely mid-Wales-ish scenery. The transport was a 628 which at least has the merit of being reasonably comfortable. This was definitely a 628 day. This one is 413, amid rather drab surroundings at Selb Stadt. 8.3.01. Back at Hof another 628 was waiting in the bay platform 1a, to be 1441 to Selb Stadt. From the window 234538 was noted on an IR heading north at 1441; the one to Dresden at 1241 had 234475. Selb turned out to be a very drab station at the end of an unexceptional branch by today’s high standards. There wasn’t time to look at the town, so that remains a mystery. Back to Hof for the third and last time, this time for the 1632 RB to Neuenmarkt-Wirsberg, with connection (hopefully) for Lichtenfels. Yet another 628, arriving late and being delayed by Rabbit 218004 setting off to Marktredwitz. The 1641 IR to Dresden was noted with another 234. The driver of the 1632 was going to do exactly the speed required to maintain his schedule, late or not, which was fairly frustrating. He miscalculated slightly though, and gained 2 minutes so that there was still 5 left at Neuenmarkt-Wirsberg before the connection to Lichtenfels, inevitably a 628. This driver was more purposeful and we kept time down the Main valley, arriving at end of track for the day, Hochstadt-Marktzeuln, at 1811 with daylight still more than adequate. On arrival in Lichtenfels there was an hour to grab some supper. GBG pubs were 1) not locatable on street map and 2) too far, so I retired to ‘Alter Fritz’ (whoever he was) in the pedestrian precinct for a steak and Leikeim Weissbier. Both nice, though I’d rather have waited longer for the steak and had it cooked… Leikeim comes from Altenkunstadt, a town near to Lichtenfels. ‘Kurt Weill’ (ICE 1512) was 3 minutes late, the bounder. Kurt was a composer (Threepenny Opera etc) who emigrated to the US in 1933. So did Else Laske-Schüler, the writer after whom ICE846 is named. Strange, that. Still late at Saalfeld - the Erfurt connection was held, but very little time allowed if you were at all slow on your feet. This was an RE formed from the Siemens VT-whatevers (low floor, huge windows, no tilt). 232432 seen at Arnstadt on passenger, heading towards Erfurt at 2100. The slight lateness caused by the ICE had been recovered by Neudietendorf (junction of Arnstadt and Gotha lines from Erfurt) and there was just time to get to P2 and check the times before the SE to Gotha. The Waldbahn Hotel is nearer and better than the Comfort/Quality/Treff/whatever it is this week. Too idle to go into town at a late hour I wandered down to the bar and got Warsteiner for my pains. I then discovered that the other (unlabelled) font dispensed Gotha Pils but I couldn’t summon up the enthusiasm. 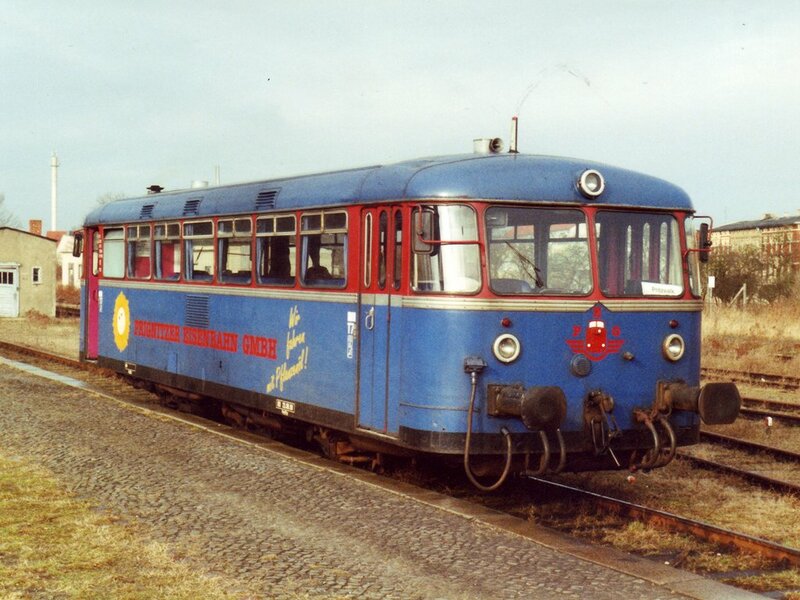 The Kreisbahn Mansfelder Land railcar for Wippra waiting at Klostermansfeld on 9.3.01. Breakfast while watching the Waldbahn trams go by. Not a bad establishment really, albeit devoid of English speakers. Not that there’s anything wrong about that. It’s in Germany. 0821 IC to Erfurt had the exact opposite of yesterday’s RB driver. Tore into Gotha several minutes early, waited time. Eyeballs out all the way to Erfurt, several minutes early, waited time. 232615 was noted at Erfurt with two coaches on 0841 Meiningen. There appears to be a curve, or at least through siding, from south (high level) to west (low level) at Sommerda which is not shown in S&W. 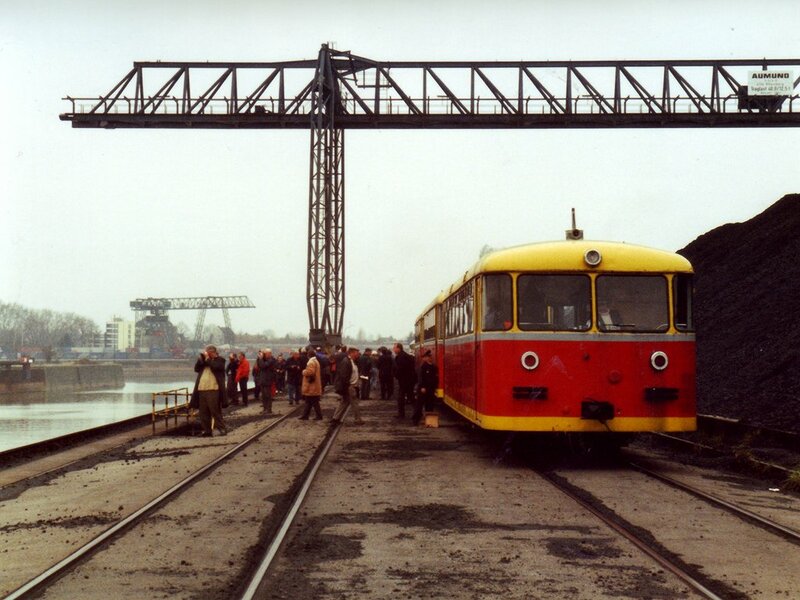 This was viewed from an Erfurt - Sangerhausen SE, electrically pushed double deck stock. On to Sangerhausen where a 218 was waiting with an RE to Magdeburg. 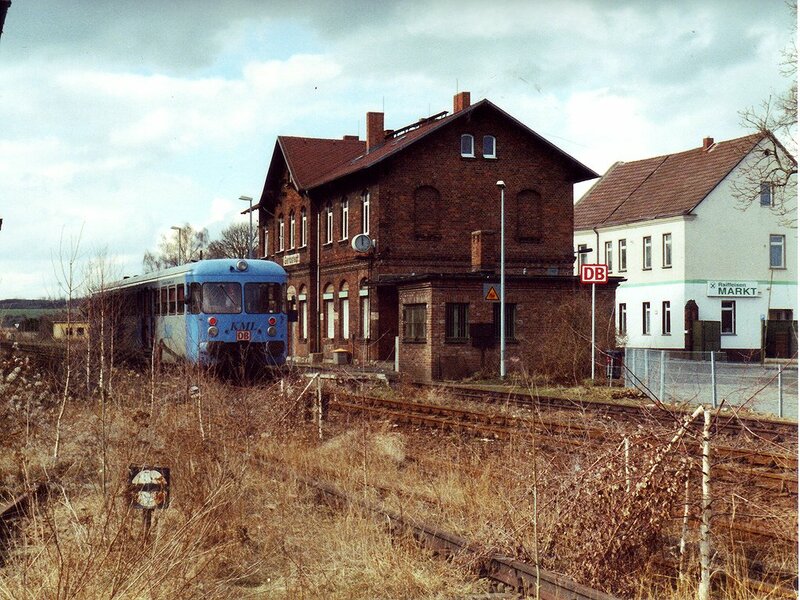 Later the same day another KML unit took me to the run down terminus at Gerbstedt. The Wippra branch is ‘privatised’ though seemingly run as a DB associated operation with trains shown as RB and EuroDomino accepted. The unit is a bogie railcar with disabled lift and all mod cons. [And was absolutely immaculate, even down to a vase of flowers in the loo!]. The line has its own website at http://www.wipperliese.de. On summer Sundays at least one train runs to/from Helbra, where the station is on a distinctly separate alignment, off the Sangerhausen-Magdeburg line. This would also do the physical connection on to the Wippra line, which is south of Klostermansfeld. The branch is very pleasant once away from Klostermansfeld, and follows the valley of the Wipper up towards the Harz, in typical Harz scenery. There is timber traffic, but not many passengers, at Wippra where the line appears to have continued at one time. [Not according to S&W 2000]. The timber traffic presumably accounts for the standard gauge diesels at Klostermansfeld. Only me on the return journey, plus one lady who got on at Mansfeld, formerly Mansfeld (Südharz), one station before the junction. 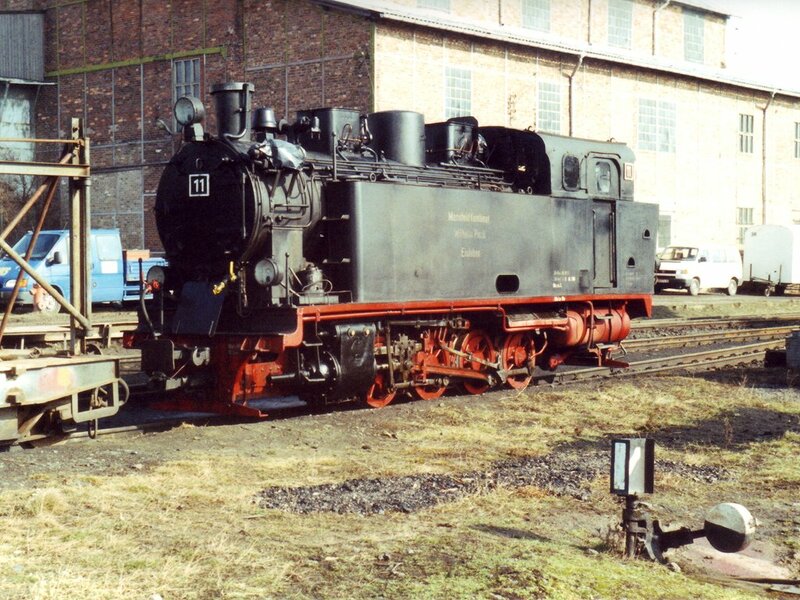 Another 218 obliged to Hettstedt, with the narrow gauge occasionally visible alongside. Hettstedt station is in the garage quarter some way out of town, so nothing to do but vegetate for half an hour before joining another KML (Kreis Mansfeld Land) railcar, not as smart as the Wippra one though still immaculately clean. Four passenegers took a slow trundle to Gerbstedt over what looked like fairly poor track. I wouldn’t put money on it. 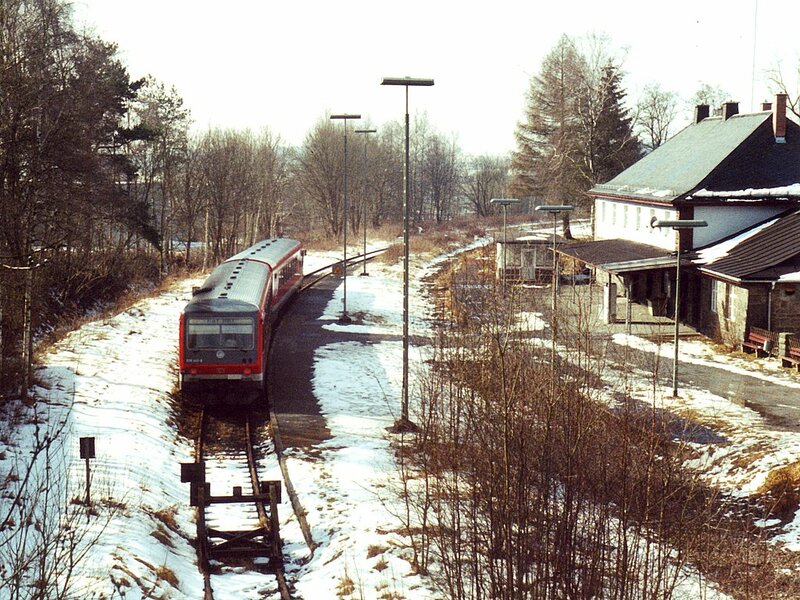 A bufferstop at Gerbstedt prevents access to the line on to Heiligenthal. Faced with 50 minutes in Gerbstedt, the pub was the only option. Ten minutes got me to the Ratskeller in the centre of ‘town’ (Shifnal size, if that). In a few million DMs time Gerbstedt will be a very attractive little place, and it’s getting there. It’s got a pub and a cash machine, what more do you want? A pub that doesn’t sell Ur-Krostitzer Pils, is what, but any port in a storm I suppose. It’s not much over 5 minutes walk and closes 1400-1800 so my 1330-1420 stop was very fortuitous. Back through the pit mounds to Hettstedt and another Rabbit to Magdeburg. Passed 219070 on (presumably) RB36667 1400 Halberstadt-Halle at Sandersleben. Last track of the day was Hettstedt to Güsten. Supplies were obtained at Magdeburg to tide me over to Schwerin. Perhaps Zur Guten Quelle will be open this time; if not, there’s always McDonalds! Used the lines marked as S-Bahn all through Magdeburg and out to Rothensee. Completely uneventful run to Schwerin enlivened only by extensive track work north of Wittenberge. These IRs are given the better part of 15 minutes at Magdeburg, Stendal and Wittenberge; despite all this and a punctual departure from Ludwigslust we were 3 minutes late at Schwerin! Zur Guten Quelle was indeed open but seemed to have lost some of its atmosphere. Mostly the part stuck to the walls I think, but the new light coloured tiled floor is a bit McDonalds. Nevertheless, a nice pork steak and chips, washed down with Duckstein, a ‘red-blond’ beer from Holsten, and a Franziskaner. The red bit in Duckstein appears to be caramel but since they’re not supposed to do that, it must be roasted malt. My usual caution with time paid off as the InterCity had a night porter who didn’t lnow how to deal with special rates, credit cards etc. His colleague, who had been 15 minutes ‘changes the clothes’ eventually appeared and dealt with the card. Proper little madam she looked, too. The double deck stock on the SE to Wittenberge had comfortable(ish) seats and recorded announcements in German and English, the latter seemingly by a native English speaker. I wonder when we can expect bilingual announcements on the 0617 Telford to Birmingham New Street. At Wittenberge the Wittstock line services are using a ‘temporary’ (but very well constructed, with shelter, seat, noticeboard, lighting etc) platform on the goods line adjacent to the works boundary fence. This started from 4 th Feb but there was no indication when it will finish. The lengthy trundle to Pritzwalk was at least in fog-free daylight this time and notable for the flocks [sieges is apparently the correct word] of herons seen in several fields along the way (not to mention some deer). At Pritzwalk the platform arrangements were not quite as booked. The unit from Putlitz arrived in P1 as booked for Saturday, then transferred to P2 as the Neustadt service. The unit from Meyenburg also arrived in P1 and after discussion among the PEG staff was declared to be the 0930 to Putlitz. I got in without opposition, in the hope of doing the connection into PUT1 (the bay platform) and was rewarded with just that! The terminus at Putlitz. The line used to continue to Parchim and Karstädt. The Putlitz branch diverges some 4 km out from Pritzwalk (though no connection once away from the station). Track seeme poor with very slow running for the first part and there is a severe restriction over a bridge nearer Putlitz. 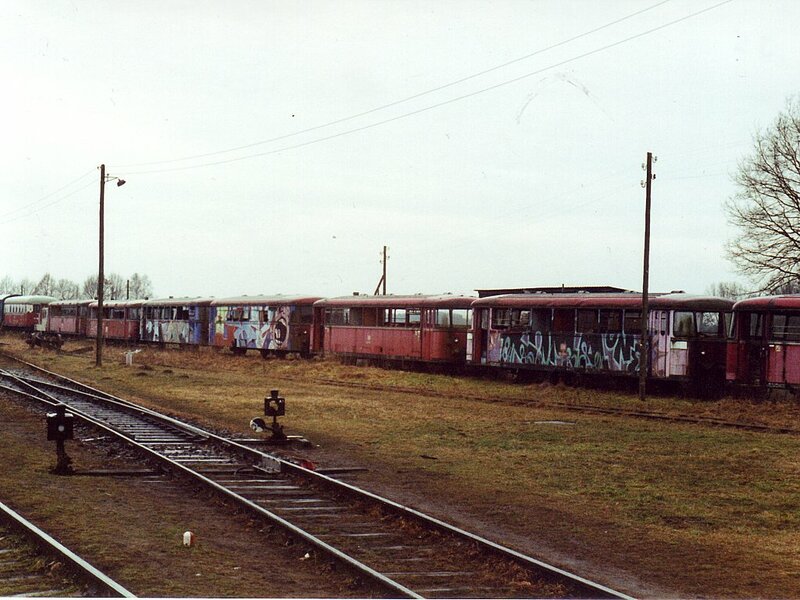 At Putlitz itself there is a scrapyard and a large number of DB departmental vehicles presumably on their way thereto. It’s hard to imagine what PEG would want with them. There is also a rusting kettle, 50 3521, and a collection of derelict triebwagen presumably being cannibalised to keep PEG’s fleet of little puce coup(é)s going. The station building is quite handsome and houses a gaststätte open from 0800. Mondays to Fridays, natürlich. Back at Pritzwalk (PUT1 again) there was time for a cup of lukewarm coffee. After ordering same I realised there were two Pritzwalk beers on offer. Ah well, it’s only 1100 anyway. The PEG timetable has been recast to avoid any risk of connection with DB; I was the only passenger to Putlitz, and most of the way back, one other joining near the end. Presumably this is to force their connecting traffic to go via Neustadt and do more PEG kilometres. I was also one of two passengers between Pritzwalk and Perleberg - it’s hard to see any of it surviving except perhaps Kyritz/Neuruppin/Rathenow to Neustadt if they can find somewhere to base the karts. 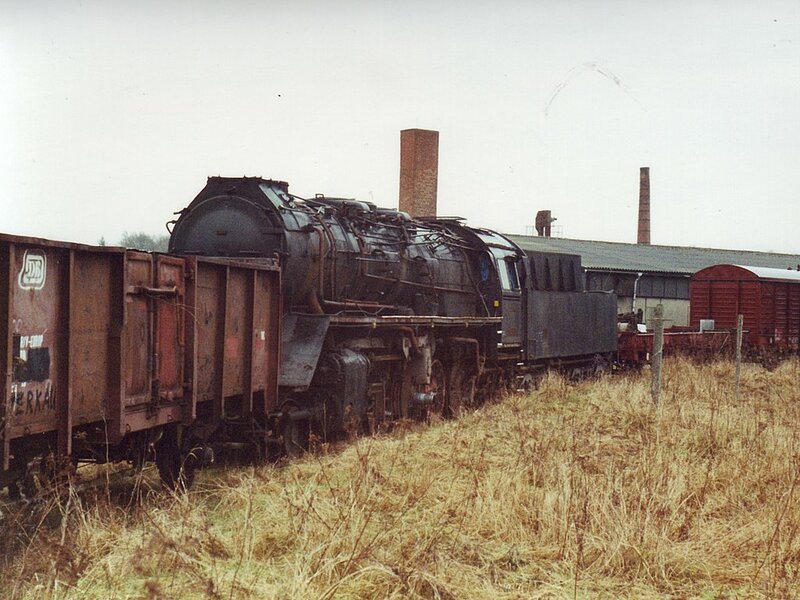 Not to be outdone by mere diesels, 50 3521 was also rusting quietly away at Putlitz. After doing Pritzwalk - Neustadt again on 1123 puce coop, momentary excitement at Neustadt. Neuruppin trains, according to the DB sheet, go out of P3 therefore doing the main line connection. They don’t. They go out of P5, with the Rathenow trains from P4. And what a featureless line it is, apart from some level crossings at least two of which were approached with the driver facing backwards, eating a sandwich and talking to the passengers. Not correct rulebook practice, one would imagine. The DB line from Wittstock is met just before Neuruppin West, then the two seem to run as single lines to Neuruppin Rheinsberger Tor (may be wrong on this, I’ll see what happens on the way back. A l-o-o-o-ng walk into town along Karl-Marx-Strasse revealed exactly one open pub (plus a takeaway kiosk with some seats in ‘t’ back). This was a real four-ale bar with two ales; the dreaded Berliner Kindl, and Markische Pils from the Dessow (sic) Bräuerei along the Neustadt branch. I found it surprisingly good. Neuruppin to Wittstock was pretty dull. Wittstock to Pritzwalk was pretty dull (a chipboard? or fencing? factory had more rail traffic and more cut timber than I’ve ever seen). Pritzwalk to Wittenberge was exceptionally dull. With a 7 minute connection and the goods line arrangements, lateness was not helpful, so naturally the Ferkeltaxis were just over 3 late. I had to run most of the way, rucksack and all but at least the station staff were on the ball and ready to hold the 1656. In the event I was in my seat, gasping for breath, just after 1655. Easy. Ish. A very uninspiring trip to Finkenkrug via Neustadt (Dosse) but at least it was reasonably quiet and comfortable in the 100 mph ‘Schönefeld Airport’ RE double deckers which seem to get everywhere but (or possibly and). The Stadthotel in Oranienburg proved easy enough to find, but 20 minutes walk (I went the long way round the rectangle, of course). Arriving in the rain, having not seen anything worthwhile en route, an early night seemed advisable. I was pretty impressed with myself for answering the 64,000 zloty question on Polish ‘Who wants to be a Millionaire’! [Well, OK, you find me something more thrilling to do on a wet Saturday night in Oranienburg, then.]. Rheinsberg is a pleasant enough station (and a branch which must be a nice ride in summer though a bit grey today) but is possibly the only one I’ve encountered outside the UK without a departure sheet. I’ll just hope for the best. Fast cars to Neuruppin if not! The station Gaststätte being shut I had a walk into town and found the Café Voltaire which did me a cup of coffee. Radeberger vom Fass was available for an additional 50Pf, but Radeberger at 1015 didn’t seem an attractive prospect, vom Fass or not. By the time I got back to the station the Gaststätte was open, of course. The train appeared only a couple of minutes late. I left ticket purchase until it was in sight… DM15.70 got me back to Berlin, so total 26.80, only ⅔ of the price of a SWT. On the return to Herzberg it ran straight into A (see diagram earlier). Slightly early into Neuruppin Rheinsberger Tor where there was satisfactory overlap in P1 with yesterday’s kart to Wittenberge. I’ll not rest until Hennigsdorf though, where there is an S-Bahn alternative route. Didn’t even then - the Rheinsberg trains reverse at Hennigsdorf and head round the Aussenring as far as Finkenkrug. Arrival at Spandau was on time, then, amazingly, 3 late departing! Route into Spandau and Charlottenburg was as predictable from S&W, viz. diveunder west of Spandau, southernmost passenger lines therethrough, down to Heerstrasse (but not on S-Bahn), under S-Bahn just before Eichkamp. I made Charlottenburg in time for the 109 bus at 1316 (it goes from the east end of the station) and I was at the BA desk for 1335. Memo (following on from earlier): the U-Bahn to/from Jakob-Kaiser-Platz is the best bet. Both buses (X9 and 109) stop outside and are not yet into/are out of most of the traffic by the time they get there. Whilst self employed, the Easter weekend was too good an opportunity to get 4 days off without losing any income, so off we went to Germany yet again, with a threatened cross-border service in mind.